This ectended shackle version has a huge 310mm clearance which makes it idea for securing bikes through the wheel and frame. It is also great for gates. 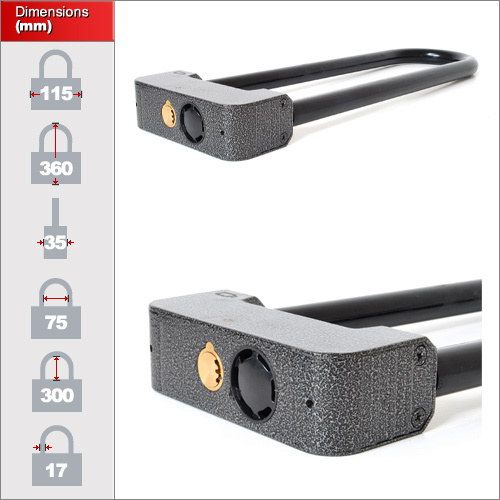 A 15mm steel shackle makes it highly resistant to bolt cutters and saws. 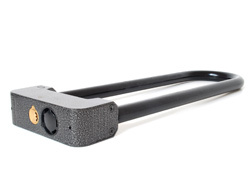 Each lock comes with 3 keys that opperate the anti-pick cylinder barrel. This model can be used with the alarm active or deactivated which is useful since they can be set off by strong wind or where it might be accidentally knocked. It should also be set to inactive when transporting. Once activated the lock will become live within 15 seconds which gives you time to fit it to your gate, bike, or chain etc. The lock then has a fail safe movement sensor which detects movement within a 5 second period. For example 1 movement within 5 seconds will not activate the alarm. 2 or more movements within 5 seconds will then activate it. This prevents the alarm from being triggered accidentally by wind. 1. Follow the proceedure above but when you insert the shackle into the body and no "beep" is heard then that is the inactive position, (opposite to the live position). Although the lock does use weatherproof electronics we would not recommend this lock for prolonged outdoor use for weeks where it is exposed to rain. If there is a cover or roof preventing the lock from getting wet then it ok to be used outdoors. Remember to ensure the lock is orientated upwards so that the alarm holes are not exposed directly to the rain. Please see the Xena models as a fully weatherproof alternative. Each lock comes with batteries installed, although the batteries are readily available from your local supermarket. If the lock is not being regularly activated then you should see at least 1 year battery life from the lock but it is recommended to test it every 2-3 months anyhow. Even without the alarm these locks are good all round locks. However studies do show the alarm to be an effective deterrent. They are often used locked alone to items such as tools, tool boxes, steering wheels simply to warn someone that an item has been moved or tampered with.